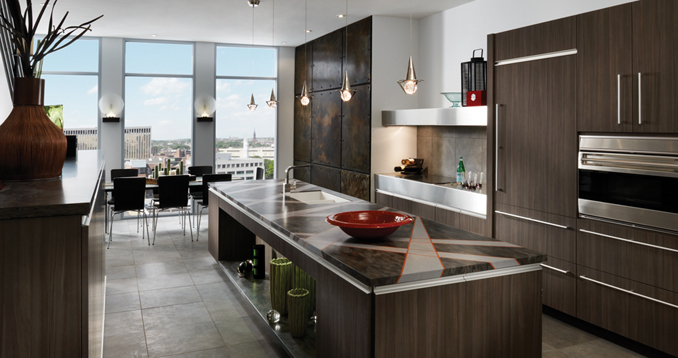 Visit our showroom to see displays of our cabinetry. Imagine having no limit to your choices. Rainier Cabinetry & Design offers the full range of fully custom and semi-custom cabinetry from some of the finest manufacturers in North America. Each company has a caring commitment to the environment and is certified by the Kitchen Cabinet Manufacturers Association Environmental Stewardship Program. Get started by booking an appointment with one of our cabinet designers, who can help you create your unique space. ~ JENNIFER K. & JOHN M.
The very best in American-made craftsmanship, Wood-Mode luxury products are the culmination of more than 75 years of quality workmanship and design leadership. Known for the beautiful furniture finishes and extensive customization capabilities, Wood-Mode delivers designer cabinetry with quality materials and personalized solutions. Brookhaven by Wood-Mode provides the same dedication to quality materials and American craftsmanship in a select group of products and customization to meet your budget. The Brookhaven selection of styles, finishes and storage solutions puts the Wood-Mode lifestyle within reach. 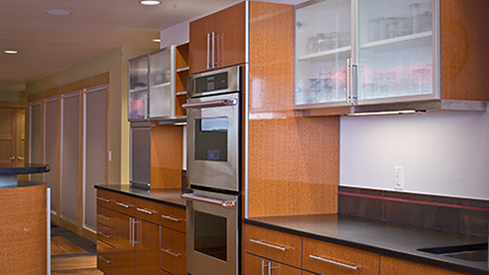 This North American cabinet company, based in British Columbia, Canada, produces high-quality, frameless cabinetry. They offer a vast selection of styles and finishes to suit every style. From sleek modern to old-world traditional, Columbia Cabinets offers it all to homeowners looking for quality craftsmanship and exceptional value. Have any questions about our cabinetry?